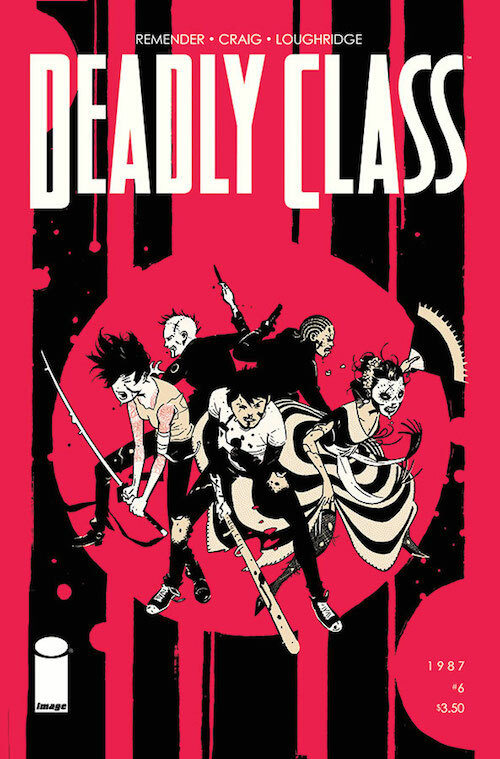 I have an evolving monthly pull list of only four or five titles, and one of them for the past six months has been Deadly Class. Co-created by Rick Remender and Wesley Craig, this is very much a comic for over 18s and it’s one of the reasons I plan on sticking to the end. Set in 1987, it follows a bunch of kids from some pretty dysfunctional backgrounds who end up together at a ‘school’. It’s what happens from then that forms the story, and what a story it is. Rick Remender has been pretty forthright in the letters column of the sixth issue about how a lot of the events are based either fully or partially on his own life experiences. It brings a further edge to an already knife-sharp creation. Even some of the best comic writing can dip into stereotype, but Remender mostly manages to avoid that trap, although the racial divides within the group veer pretty close to that territory. Wesley Craig’s art is superb, bringing the extreme changes in pace and emotions into sharp focus. I also love the page at the back of each issue showcasing Craig’s drawing process. A huge hat-tip to Lee Loughridge’s colours on this title as well, they are stupendous. Deadly Class is not for the faint hearted and definitely not one for those squeamish with violence, drug use and full frontal nihilism. What it is though, is a great story – all the more powerful for its partial foundation on Remender’s own life. If you can scratch up the first six issues from somewhere, do so. If not, get your order in for the second story arc that’s due to start in September. I know I’m counting the days.